To overcome age discrimination through education. To promote fitness through a healthy lifestyle. 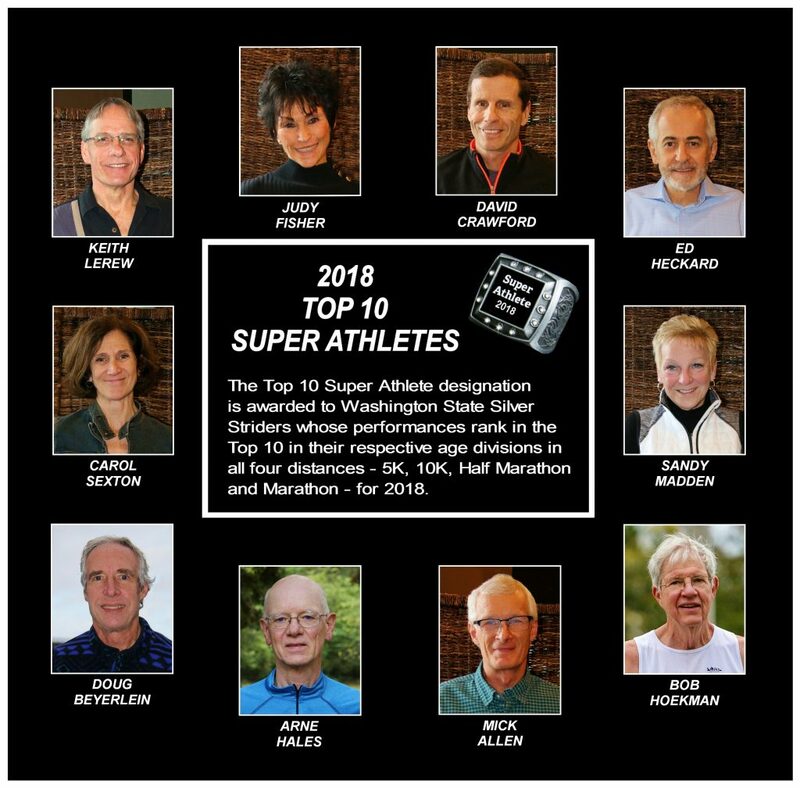 Ranked are the top 10 athletes in each Silver Strider age group for the State of Washington. Just click on TOP IO on the menu bar. If you are ranked #1 in your age group, please send me a photo of yourself for display. 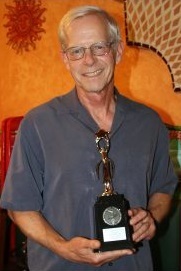 If you have a correction or addition, please contact jerry@silverstrider.com by email. Rankings are based on the fastest performances on road or trail courses that are USATF or Silver Strider certified. Track times are not considered. Important note: The 2019 rankings end November 30th. The 2020 rankings begin on December 1st. 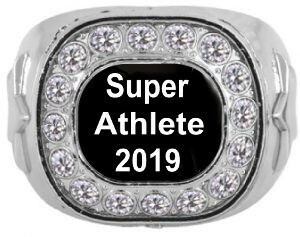 Congratulations to our Super Athletes for 2018, Sandra Madden, Bob Hoekman, Mick Allen, Ed Heckard, Judy Fisher, Carol Sexton, David Crawford, Doug Beyerlein, Keith Lerew and Arne Hales. The goal of the Grand Prix Series is to provide fun, camaraderie and motivation for training. There are 28 races in the Series. Points are for your 8 highest finishes. Run or walk a minimum of 8 races and you are a finisher. All finishers receive a trophy and a gift certificate. The gift certificate will be to a running store and/or a free entry to a race. The male who completes the most Grand Prix Series races will receive a $50 gift certificate and the title “Mr. Grand Prix- 2019”. The female who completes the most Grand Prix Series races will receive a $50 gift certificate and the title “Miss Grand Prix – 2019”. NOTE: If you enter a new age division during the year, you bring your points with you. You will finish in the age division you are in at the last Grand Prix Series race. Tie Breakers: In case of a tie in points, the participant with the most races at the end of the season wins. If they have the same number of races, the older person wins. To add to the fun, we are making two of the races “T-shirt Races”. The first t-shirt race will be the Silver Strider Fun Run and Potluck in December. Every participant who wears the shirt, black, pink, or neon, receives 10 points regardless of where they finish. Runners not wearing a series t-shirt will receive their normal points according to their finish position. To check the current Grand Prix Series standings, click on GRAND PRIX STANDINGS on the menu bar. The second t-shirt race will be the race of your choice for buying and wearing one of the neon shirts. For registration or information on the GP races, click on the event ad on the right side of any page. Please check “Bulletins” and “Thrifty Runner” to get current information about upcoming Grand Prix Series races. The Grand Prix affords the opportunity for every runner and walker 50 years of age and older to receive recognition and rewards for their participation in the Series. Every finisher, who completed 8 or more GP races during the 2017-2018 Series received a trophy, personalized with their name and division place. In addition, those present at the party received a $50 gift certificate to one of our running store sponsors and a free entry to an upcoming Grand Prix Series race. Those who win their age division, receive a pair of running shoes from South Sound Running.